Papers: 7 letters (1871-1895); and 3 items (1869) in the Tyler Davidson collection. Papers: Correspondence in Camp family papers, 1817-1953; Justin S. Morrill papers, 1814-1937; and Andrew Dickson White papers, 1857-1867, available on 8 microfilm reels. Papers: In Samuel Francis du Pont papers, 1812-1865. Papers: 1846-1896. 31 clipping books, ledgers, correspondence, reprints of speeches and 81 feet of microfilm. Includes papers on permanent loan from the State Library of Ohio, photocopies, and microfilm of originals in the Library of Congress. Chiefly political correspondence. Topics include the silver question and post-war redemption of greenbacks. Papers: In Salmon Portland Chase collection, 1824-1881. Papers: 42 letters in the William Henry Smith papers; correspondence in Albert G. Porter collection, 1759-1942; W.R. Holloway papers, 1824-1899; and Lew Wallace papers, 1799-1923. Papers: 1836-1900. 132 linear feet. 604 volumes of letters received (1836-1900); 8 volumes of letters sent (1874-1893); 3 scrapbooks (1897-1900); and other papers relating to his role in Ohio politics after 1850. Includes family and general correspondence from his service in Congress and the cabinet, and papers relating to Kansas in 1856, when he was a member of the House committee investigating conditions there. Finding aid. Also 2 microfilm reels of letters (1848-1893), originals in private custody. Additional Papers: Correspondence in Nathaniel Prentice Banks papers, 1829-1911; and Louis Theodore Michener papers, 1880-1027. Papers: 1839-1921. 46 items. Includes correspondence relating to political issues, social affairs, and personal business and drafts of speeches on impeachment of President Johnson. Correspondents include James A. Garfield and William McKinley. Papers: Ca. 10 items (1861-1897) in various collections. Papers: Correspondence in Joseph P. Bradley papers, 1836-1937; and Marcus L. Ward papers, 1883-1912. Papers: 1841-1892. .5 foot. Correspondence relating to personal and political affairs, especially the Civil War. Additional miscellaneous items and photographs in various collections. Papers: 7 items (1860-1894); and 1 letter (January 14, 1889) to Miller A. Wright regarding the appointment of southerners to President Harrison's cabinet in the Gilder Lehrman collection. Finding aid. Papers: 1 box. Correspondence with William W. Belknap, Sherman R. Curtis, James W. Grimes, James Harlan, George W. Jones, John A. Kasson, and Samuel J. Kirkwood. Papers: 1852-1898. 64 letters. Concerning fiscal policy, political issues, appointments, and the Republican party. Papers: Correspondence in Andrew Dickson White papers, 1857-1867, on 8 microfilm reels; James M. Edmunds correspondence, 1861-1866; and McCreery family papers, 1818-1948. Papers: 19 letters by and 9 to Sherman (1852-1897) in various collections. Finding aid. Papers: Material documenting Sherman's 1880 campaign for the Republican presidential nomination in Warner M. Bateman papers. 24 boxes. Finding aid. Papers: In Carrington family papers, 1749-1929; William Smith Mason collection, 1800-1829; and S. Griswold Flagg collection, 1825-1938. Research Libraries Information Network In addition to the institutions listed above, items are also cataloged in collections at: Brown University, Providence, RI; New York Botanical Garden Library, Bronx, NY; and State University of New York, Buffalo, NY. Bridges, Roger Dean. "The Constitutional World of Senator John Sherman, 1861-1869." Ph.D. dissertation, University of Illinois at Urbana-Champaign, 1970. ___. "John Sherman and the Impeachment of Andrew Johnson. "Ohio History 82 (Summer-Autumn 1973): 176-91. Burton, Theodore E. John Sherman. 1906. Reprint. New York: AMS Press, 1972. Crenshaw, Ollinger. 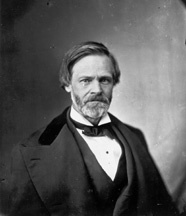 "The Speakership Contest of 1859-1860: John Sherman's Election a Cause of Disruption?" Mississippi Valley Historical Review 29 (December 1942): 323-38. Gaither, Gerald, and John Muldowny, eds. "Hinton Rowan Helper, Racist and Reformer: A Letter to Senator John Sherman of Ohio." North Carolina Historical Review 49 (October 1972): 377-83. Harn, George U. "John Sherman." Ohio Archaeological and Historical Quarterly 17 (July 1908): 309-36. Kerr, Winfield Scott. John Sherman: His Life and Public Services. 2 vols. Boston: Sherman, French & Co., 1908. Lewis, Ernest Gilmore. "Some Contributions of John Sherman to Public and Private Finance, 1855-1881." Ph.D. dissertation, University of Illinois, 1932. Matthews, John Herbert. "John Sherman and American Foreign Relations, 1883-1898." Ph.D. dissertation, Emory University, 1976. Nichols, Jeanette Paddock. "John Sherman: A Study in Inflation." Mississippi Valley Historical Review 21 (September 1934): 181-94. ___. "Rutherford B. Hayes and John Sherman." Ohio History 77 (Winter-Spring-Summer 1968): 125-38. Patrick, John Joseph. "John Sherman: The Early Years, 1823-1865." Ph.D. dissertation, Kent State University, 1982. Randall, James G. "John Sherman and Reconstruction." Mississippi Valley Historical Review 19 (December 1932): 382-93. Sherman, John. Recollections of Forty Years in The House, Senate, and Cabinet: An Autobiography. 2 vols. 1895. Reprint. New York: Greenwood Press, 1968. ___. Selected Speeches and Reports on Finance and Taxation, from 1869 to 1878. New York: D. Appleton & Co., 1879. Stern, Clarence Ames. Golden Republicanism: The Crusade for Hard Money. Ann Arbor: Privately printed, 1964. Thorndike, Rachel Sherman, ed. The Sherman Letters: Correspondence Between General and Senator Sherman from 1837 to 1891. 1894. Reprint. New York: AMS Press, 1971.